Carbonless Forms is rated 3.9 out of 5 by 40. Rated 5 out of 5 by Maria from Receipts They are just as I expect them to be and the promotion was amazing, got them for a a very good price that made it such a good deal! Rated 5 out of 5 by todd123 from Quick, economical, exactly as expected Arrived a day earlier than expected. Very quick turnaround (not 48 hours, but they give you an estimate that seems to be accurate, and it's quicker than other competitors). Product is as expected. The only thing I will say is that the margin for the image is slightly larger than on the PDF provided, but it is not a big deal at all. Rated 5 out of 5 by techwreck from Great product, quick service! Very happy with my purchase. Easy to order, upload, pay and track. Carbonless form printing takes away traditional carbon paper. Each printed invoice, receipt, or purchase order presents your company’s branding. Each custom carbonless form can stand out from the competition in different industries, such as manufacturing and insurance. Each set is glued at your chosen location. This ensures all NCR forms are bound together as you fill out the topmost sheet. You can glue each set at either the top, left, right, or bottom edge of the forms. You can also combine several sets in one pad. You won't have any trouble going from one carbonless form to another. Padded with Cardboard Back puts together 25 or 50 sets in a pad that comes with a chipboard back. One edge of the entire pad is glued to hold all the sets together. Padded with Wrap-Around Cover also binds 25 or 50 sets in a pad that has a white cardstock cover. You can place the cover between sets for easier writing and to avoid copies on the next form. Adding sequential numbering will help streamline and monitor your business’ daily transactions. Start carbonless form printing with us today and receive your order in 2 business days. You can upload a file on our online calculator or use our available templates. 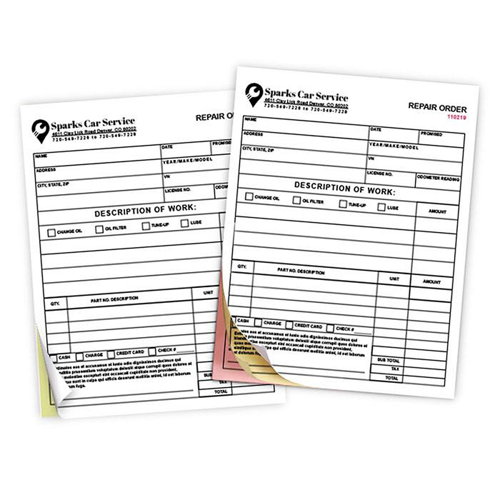 Take advantage of our low prices and order a large quantity of custom carbonless forms today. How long will it take to print and process my carbonless forms? We can print your carbonless forms in as little as 48 hours (or within 2 business days). This 2-day period is referred to as the printing turnaround time, which does not include shipping transit time, weekends, and holidays. This time begins once you have paid for your order and approved the proof. Can I use carbonless forms in a laser printer? We don’t recommend using this forms in a laser printer. It’s better to write or mechanically type on the paper to ensure the markings are copied on to the next sheet. What is the difference between the number of sets & the sets per pad? The number of sets refers to the total amount of groups of forms in your order. This refers to all sets or forms, whether they are padded or not. Sets per pad refers to how many sets are combined in 1 pad. You can choose to have 25 or 50 sets in 1 pad.